As the weather turns colder, now is the time to make sure you are signed up to receive important information from Pierce College regarding emergencies, delays and college closures. Students, employees and community members can sign up to receive emergency messages through text, email or by phone. Students and employees can visit the Pierce College Emergency Notification web page, log in with your student or employee identification number, and select the alerts you would prefer to receive: text message, cell or home phone automated calls, and/or email. If you would like to be notified of campus-related emergencies and are not a student or employee, you may register as a community member by following the same instructions. Suspended operations announcements will also be published on the Pierce College website, along with Facebook and Twitter. 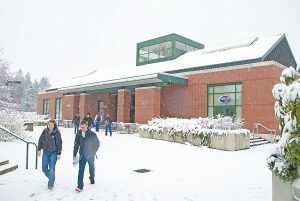 In the case of inclement weather, every effort will be made to make a decision to close or delay day classes prior to 6 a.m., and evening classes by 3:30 p.m.
Employees and students are strongly encouraged to sign up for text message and email messages that will alert you to any emergency situation or closure. For more information, please visit our Campus Safety website.